An evocative multigenerational Cuban-American family story of revolution, loss, and family bonds. Marisol vanished during the Cuban Revolution, disappearing with hardly a trace. Now, shaped by atrocities long-forgotten, her foul-mouthed spirit visits her nephew, Ramon, in modern day New Jersey. Her hope: That her presence will prompt him to unearth their painful family history. Ramon launches a haphazard investigation into the story of his ancestor, unaware of the forces driving him on his search. Along the way, he falls in love, faces a run-in with a murderous gangster, and uncovers the lives of the lost saints who helped Marisol during her imprisonment. 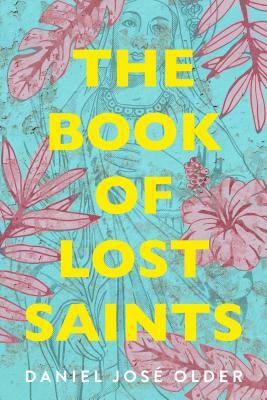 The Book of Lost Saints by Daniel José Older is a haunting meditation on family, forgiveness, and the violent struggle to be free. Daniel José Older is a Brooklyn-based writer, editor and composer. Following the release of his ghost noir collection, Salsa Nocturna, Publisher’s Weekly declared Daniel a rising star of the genre. He has facilitated workshops on storytelling, music and anti-oppression organizing at public schools, religious houses, universities, and prisons. His short stories and essays have appeared in Salon, The Chicago Sun Times, The New Haven Review, Tor.com, PANK, Strange Horizons, and Crossed Genres among other publications. He co-edited the anthology, Long Hidden: Speculative Fiction From The Margins Of History and his urban fantasy novel The Half Resurrection Blues, is the first of his Bone Street Rumba series, released by Penguin’s Roc imprint. You can find his thoughts on writing, read his ridiculous ambulance adventures and hear his music at his website.